So, I let the idea marinate for a while and came up with this fun upcycling project using a thrifted teapot, fabric from a vintage pillowcase, and fiberfill. First- the teapot. I loved everything about it- the shape, the pattern, the price. And as I thought about my “hidden” pin cushion desire, the tea pot lid became quite intriguing. Why not create a pin cushion on the underside of the teapot lid?? This post contains affiliate links for your convenience. To do so, I grabbed some scrap cardboard and traced the inner lip of the teapot lid. I cut out the egg/oval shape and trimmed it down ever so slightly so that it just barely fit inside the lid. Love to use up scrap cardboard like this! Then, I gathered a swatch of pillowcase fabric and laid it out with the right-side facing down. Vintage fabric of any kind would do. I took a wad of fiberfill–a softball-sized clump- and placed it on the fabric, directly over the pattern area that I wanted to show as my pin cushion. Then, I balanced my cardboard oval on top of the fiberfill. Carefully and with plenty of massaging/finessing, I pulled the corners of the fabric up and carefully pushed and prodded the “pin cushion ghost” into place. I wrapped a rubber band around the excess fabric against the cardboard oval as tightly as possible. I’m soooo technical with this tutorial, aren’t I? When I was satisfied with the tautness of the fabric, the evenness of the fiberfill, and the centered-ness of the flower pattern, I trimmed off most of the excess pillowcase fabric. I dotted the inside rim and concave center of the teapot lid with my favorite super glue and carefully pushed the pin cushion into place. And you know what? I’m pretty darn pleased with how it turned out!! And when I’m done, I just turn it back around. And lookie there, I can store some extra sewing supplies in the teapot, too! With stow-and-go…like a minivan but way cuter. Wouldn’t this be a fun little starter gift for a new seamstress? Come to think of it, most of my sewing friends would actually really love something so cute and functional. Wow, what a sweet and creative idea! So pretty! This is such a wonderful idea! Thank you for sharing it!! This is a wonderful idea and I plan on making one for myself but will also be making some as gifts. Thank you for this marvelous secret pin cushion. This is brilliant! A friend shared your link with me, and I will be using this idea very soon. Thanks for sharing! So glad you like it, Angela! May have to try this. I am a teapot and teacup fanatic! Thank you for this idea…how clever and how simple! Just the kind of thing I would LOVE to have! am unable to pin to Pintrest, tho. Not sure why. Thank you for including the link to your Pinterest board. I keep getting a message saying that there were no pictures to pin. The linked worked and I have not only pinned this page but also followed the board. It looks like you have a lot of great ideas. lovely, lovely, lovely – Soooo lovely! Precious! My mom oases away and I gave my sisters and Neices the teapots but kept a few show loved to sew and I live to crochet, thanks for helping me keep my mothers memory alive. I couldn’t pin it either. I have a great idea: sell them in your etsy shop. Post when you do. I agree – best sewing caddy ever! What a lovely idea. I am going to have to go teapot hunting. I saw a wonderful teapot at HomeGoods so if it is on sale, I’ll grab it. Unless I find a cuter one at Goodwill or see if I have one in my stash. It is so cute and I will make a few for gifts. Such a sweet idea- I have always loved the teacup version. Love this one- I have a similar teapot, but alas, no lid. I love the idea of being able to store goodies inside! Sarah, BRILLiant. Just brilliant. I want a pin cushion so terribly bad. They are so convenient during a project. Mine, however, are inconveniently stored in a tackle box to keep them safely stored away from my animals. I have had TWO animals…both a dog and a cat ingest needles that got lodged in their stomachs after they swallowed them. After extremely expensive surgeries for the both of them they were fine and I learned my lesson. So the danger of pins and needles around animals IS very real. I am SO excited about this. Can’t wait to find a teapot as cute as yours! Great idea, I also have a young kitty who loves to eat pin heads… And too many teapots that don’t get used. Brilliant!! For years I have had one made from a tea cup with Styrofoam ball and some batting covered with cloth and glued in with braiding! Styrofoam is great. Bought at craft fair about 10 years ago! Great idea! If you have (or make) an emery or crushed glass strawberry, you could glue it into the spout so it would be handy for cleaning/sharpening needles and would also seal the spout (and if it stuck out a bit, protect it from chipping). Oh my gosh, this is just darling! I have no kitties to worry about, but still want to make one! lol! Cute gift idea as well. Thanks for sharing with SYC. I will be featuring you next week. Absolutly love this, what a perfect gift this will make for my friend !!!! I love this idea! And I have several tea pots I could do this with. I love this! A friend recently gave me a teapot almost exactly like this one and now I know exactly what to do with it. Thanks for sharing your great idea. This is so cute and clever – You nailed this this project perfectly. I have a teapot from my grandma that I might have to try this with. Great article. Just moved Into an independent living apartment with several other likeminded women in residence at this complex. Now I can see many lovely teapot pin cushions for gifts in my future. Thank you so very much for sharing your creation! Just love it. Sarah – this teapot turned pincushion is sooo stikin’ cute! I love what you did with it. Thanks for linking up to Catch as Catch Can, catching you! Next time I find a pretty teapot I’m doing this! Thanks… I might have to make a ouple actually and send the other one to my Nanna! What a fabulous idea. I make them from teacups but never thought to use the teapot! BRILLIANT idea – absolutely fabulous and I am so (sew, snicker snicker) doing this! Love the idea. Thanks so much. This is the cutest idea ever! Thanks so much for sharing with us at the Merry Monday link party. Hope to see you again next week. Shared your post on Twitter! Oh, awesome! I have an old teapot that was my great-great grandmas, and while I wont be doing this to the pot (she brought it over from England when she immigrated), I lucked into the matching creamer and sugar bowl at the antique store. I think I will do this with the sugar bowl! This is so cute. I’m sitting at my kitchen counter looking at a teapot on the shelf. Guess what I’ll be doing this weekend? Thank you for the tutorial. Just saw this on The Quilt Show (thequiltshow.com) web site. LOVE IT! Got to hit the thrift store today so I can make one. Do I neeeeeed one? No. Do I have to have one………? YES! Thank you for the tutorial. I love it! And I all ready have the perfect tea pot to make one!! Thanks for this wonderful, and useful, idea. I bought 3 larger teapots from the local thrift store and they just sit on the shelf looking pretty. Now they can be pretty and functional at the same time. What a great idea! How about those cookie jars. Now that is mega pin cushion and storage. That’s brilliant!! I am dropping everything to make one now! Haha, I love it! Let me know how yours turns out! Great idea. I have a small to medium collection of unique tea pots and this will be great when they are sitting around my sewing area or even for when I am watching television in my family room or any room in the house. Thanks for posting this. How thoughtful to be aware of the curiosity of the cat. I too had a cat who loved to pull pins from the pincushion. This is the perfect solution to having your pins within reach, but out of sight when they are not needed. I love the repurposing of someone’s cast off teapot. My tea loving/sewing friends would all love these. Thanks for the creative idea!!! I’m borderline crazy-cat-lady, as is my husband- and I’m glad the idea resonates with so many people! Precious! I can think of half a dozen friends who would love this! Thanks. This would be perfect for a beginner sewer. Just add small scissors, thread, thimble, needles, safety pins, straight pins and maybe a few buttons…instant sewing kit! Too Cute. This is brilliant! Thanks for linking up at the Stitch It, Blog It, Share Link Party. I hope you’ll join us every Sunday night at 7 with more of your creative sewing projects. This idea suits me to a ‘tea’! Can’t wait to see it, Anne- thanks!! OK, this is beyond clever! I love it! Thank you for sharing on Fiber Tuesdays! Jaw drop… Sarah, this one surprised me. What an incredible idea to make with all those teapots sitting in the thrift stores! LOVE this so much! Oh Sarah, this is such a wonderful/beautiful idea. Would you mind if I borrowed your idea for our church Christmas Bazaar? The ladies are always looking for new craft ideas and I can already see Christmas teapots (from thrift stores of course) used for this purpose. Thank you so much for sharing! Hi, Sharon- of course!! The best way you can thank me is to tell everyone where you saw the idea first. Word of mouth is my blog’s best friend. 🙂 Thank you so much for asking!! I have plans to make some tea cup pin cushions for a few friends. This is way cooler! What an awesome project! We love it! Thank you for sharing at Dream. Create. Inspire. Link! You’re one of our features this week! I hope we’ll see you there again this evening! I love, love, love this idea!! We’re featuring it at Dream. Create. Inspire. Link. tonight, and I’m off to go make my own. 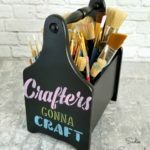 🙂 It’s such a great idea – as are all of your upcycled projects!! Just curious…. do you know the pattern of the tea pot? It looks like my Mother’s pattern. I have never seen the teapot though. It is very pretty and a great gift idea. I’ve assumed that it was a Johnson Brothers pattern, but it’s not marked on the bottom! So perhaps a knockoff? Such a cute idea! And I really love the teapot you found. I am a collector-can you tell me the brand and pattern of the one shown. I love the design. Thank you, Kathleen! Amazingly enough, there’s no marking on the bottom! I looks very much like a Johnson Brothers design, though, doesn’t it? What a cute idea! Thanks for sharing at Inspiration Thursday! Have a great week! Wonderful idea–I love it! And the teapot is so pretty! Thank you, Carol! I love it, too- and I love using it every time I sew!! Thank you so much, Janice- I appreciate that! Love this, how about pulling thread through the spout, or using the spout as a small scissors. Thank you for getting my imagination in high gear. Happy New Year. Such a cute idea!! Great “technical ” tutorial…just the kind I like!! Love it! I recently bought a sewing machine with table teapot at a second hand store. It was so cute and just had to have it for my sewing rom. Well now it’s going to be cuter and functional because of you. Thanks for the great idea! Sadie, as soon as I saw what you did I made one too! Mine is made from a large antique china sugar bowl that I love but didn’t have any place to display. Now it can be out being shown off and making my sewing room just a little more tidy. ( I have a cat like yours who likes to pull pins out of the pin cushion. Sorry Charley, you can’t do that anymore! What a neat idea! I am visiting from The Creative Circle and I’m so glad I did. Great blog! Oh wow! What a cute idea! This is a wonderful idea. Not only do I want to make me one but this is a nice gift for anyone who sews. My 94 year old mother has collected teapots for many years – we’ve always tried to think of a useful way to share them with family. Thank you so much for a beautiful idea. Um, okay, Sarah? You. Are. Brilliant. I literally gasped when I saw it! I love this!!!! I was so impatient that I could only find a “sugar bowl” but when I got home found out it used to have Este Lauder face cream in the jar so I made it!!! Smaller but nice too! This is such a great idea. I love the look. I commented before but this is so unique and so darling, I just love it. Great inspiration! This is absolutely brilliant! I love it!! I don’t have a cat, but I just might have to make one of these for myself!! You must have seen my Instagram video of my daughter’s kitten Bean removing pins from my pin cushion with her teeth! This solves that problem… now if only I can stop her jumping at the moving iron cord..
Good intructions! Thank you! I have a clear glass teapot that i want to put a pin cushion into. Do you know how i can make one that looks clean + finished on all sides ? Thank you! 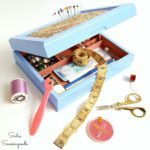 I have a Spanish blog where I share ideas like yours , and I have recently published in it this wonderful pincushion post you created with all credits to you, links to your page and images leading to your blog. I’ll be using this one for sure! Very clever and absolutely darling!! Thanks for sharing at Throwback Thursday! The Tea Pot looks so easy but it takes a smart person like you to figure that out. Thank you for sharing this idea. I just found this on pinterest and love it! I remember making pincushions in Girl Scouts out of Mason jar lids. We used Brillo pads as the stuffing. My leader, who just happened to be my mom and a seamstress, said the brillo pads would help keep the needles clean and sharp. I will be making one of these for both my mom and mother in law for Christmas! What a great idea! Thanks! Love it. Love the idea of filling the pot with small supplies (I love buttons!). Using the bouquet motif from the pillowcase added to the vintage interest. Less than perfect teapots can sometimes have a silk flower glued over the mend or a ribbon tied on. Tiny nicks in spouts can be sanded and given a few coats of clear nail polish or acrylic paint, then nail polish. Lots of my treasures are walking wounded or “shelf pieces.” Love them anyway! I loved someone’s idea of a cookie jar: that might ALMOST be enough space for some of my button stash! A teapot can hold buttons, the cards of snaps and hooks & eyes I am always putting somewhere “safe” and then forget where! Even zippers. I’ve definitely made them out of sugar bowls for smaller versions, but yes- anything with the type of lid that has a cavity would be perfect! I love this idea! I collect tea pots and I will definitely do this with one of them. I too have a curious cat who loves my sewing items. Love your way of gathering it with a rubber band. I just made one with a vintage large sugar shell, it came out perfect! Thank you! I think you might have left this comment on the wrong post? There was no paint used on my pin cushion project.